Dear colleagues. You are welcomed by a team of like-minded people, fascinated by history and tin miniature. 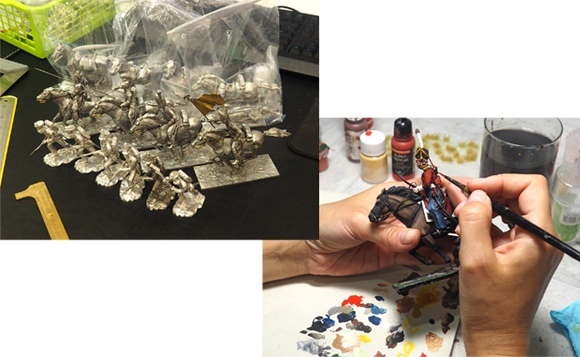 We have been working in the production of tin soldiers for more than 5 years. During this time we have accumulated a lot of experience, cooperated with industry professionals, constantly developed and improved our own production. For the production of our miniatures, we use our own "model" alloy of metal. We ourselves manufacture weapons from polished steel and make brittle or small parts of brass. Now the best professional artists and sculptors work with us. We use the advice of leading experts in the field of history and military clothing. We invite companies and stores to cooperate. Our company offers a flexible system of discounts for partners and wholesale buyers. 1. First of all, we are collecting and preparing the information from specialists in this field or the historical period. 2. According to the collected information, the sculptor thinks over the composition of the future miniature and chooses its pose. 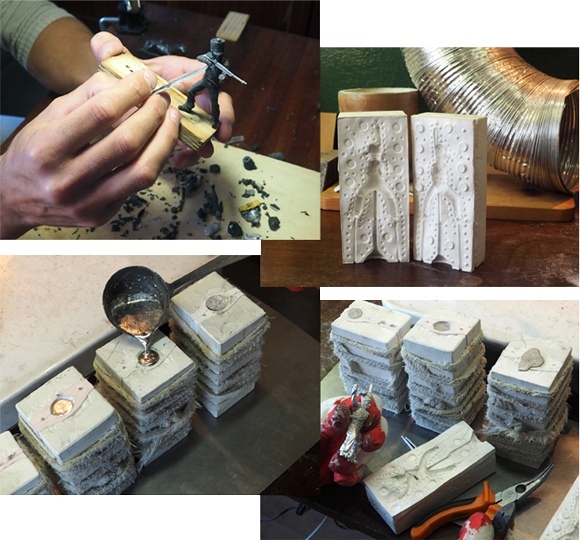 Then master creates a miniature sculpture with anatomical precision and paysattention to the every single detail. 3. The moulder and the sculptor are separating the sculpture per detail that is necessary for a high-quality foundry. After that, out of rubber and silicone are made moulds for the funding. For simple miniature are required 1-2 forms, for complex and dynamic ones 3-5. 4. Then the moulds are receiving in the foundry. The expert prepares moulds for subsequent serial production, cuts the vents, warms up the moulds and makes the necessary alloy. 5. The founder takes into account the complexity and edition of the manufacture. Also, he must select the alloy and the temperature of metals and only then foundry the circulation. 6. After cooling the mold, the founder takes out the finished parts and cuts off sprues, collects them and sending to the assembly shop. 7. The figure’s details are clear and collected. 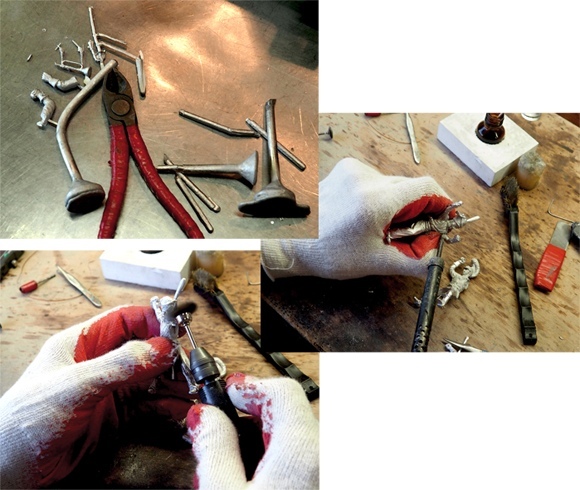 Constructed miniature goes through a delicate clean-up by polishing jeweler’s tools. 8. 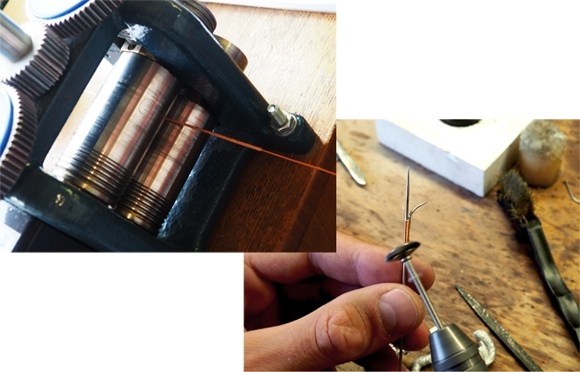 The final stage of the assembly is a completed by adding a weapon of a polished steel, copper wire, brass details of our own production. 9. All miniatures are thoroughly checked for quality and completeness. Then they are transmitted to the artists for the mural. 10. The artist applies the soil to prepare the figure for the painting. 11. By statutory tablets or sample the artist painting the miniature with precise historical certainty. The artist prescribes the tiniest details of uniform, patterns, transmits imitations of textures and materials, adds decor, depending on quality of painting: souvenir, collectible, museum.